Join the discussion on our forums! 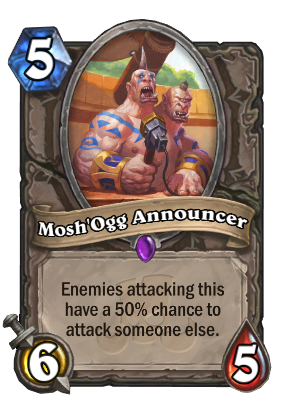 Come discuss Mosh'Ogg Announcer over in our dedicated Mosh'Ogg Announcer discussion topic. Enemies attacking this have a 50% chance to attack someone else. One's play-by-play. The other is off-color. If it did, instead of "attacking" it would use the word "targeting", so no. "someone else" meaning possibly a friendly character aswell? I wouldn't want to hurt the Podrace Announcer either. I never liked those 50% minions but some part of me is glad that they are faithful to the ogres design at least. Your opponent can try to attack this in a pinch. A stealthed Tiger will never get attacked. Advantage: Stranglethorn Tiger. Stranglethorn Tiger loses Stealth after it attacks. This ability is permanent unless silenced. Advantage: Mosh'Ogg Announcer. Your opponent can target this with spells. That doesn't work on a stealthed Tiger. Advantage: Stranglethorn Tiger. Mosh'Ogg Announcer is compatible with Taunt, but stealth isn't. Advantage: Mosh'Ogg Announcer. Stranglethorn Tiger is a beast. This has no tribal tag. Advantage: Stranglethorn Tiger. This is a 6/5. Stranglethorn Tiger is a 5/5. Advantage: Mosh'Ogg Announcer. I can't wait until the Two-Headed Tiger comes out. Ogre smart, Ogre protect own face. It’d be awkward if each head was routing for a different team. Blizzard please... "someone else" is not specific. Please be consistent in card text. Unless we test this card first hand or get clarification from developers "someone else" could mean anything. It could mean "random character", "random minion", "random friendly character", "random friendly minion", "random enemy character", "random enemy minion"
That "someone else' could be enemies, too? This will dominate the Arena, mark my words.